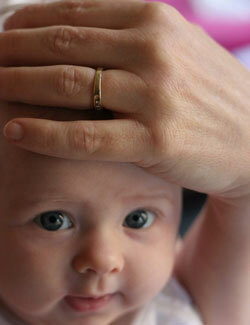 Parents will notice at birth or soon after if their baby has a flattening of the head. This can be due to positioning such as extended time spent in a neonatal unit, the birth process, position in the womb and often the infant's preferred sleeping position. It can also be caused by a condition called Torticollis (shortened muscle or spasm in one side of the neck causes the head to tilt or turn to one side). This is normally noticed by the parents noticing the baby preferring to look to one side only or even feeding being difficult on one side as the baby finds it hard to turn its head. A symmetry normally settles in the first few weeks after birth. However, because the baby's skull is still soft and malleable moulded by external forces can result in any existing flattening not necessarily disappear on its own. The parents often understandably become worried and seek their GPs advice. If the condition is caused by the muscle spasm it is a good idea to treat this to prevent the flattening from getting worse. Muscle spasm is something an Osteopath can help you with so do not hesitate to call us. For further advice please call us on 020 7586 6022 so we can refer you to the best Medical Practitioner.